Just reminding that for costume making I will be following the tudor costume page and advice from previous participants and ‘kentwell elves’ on materials suitability and for the difficult bits [ie kirtle bodice ] I am currently a hoping-to-be re-enactor but with no experience and we are really keen as a family to join the tudors. Other people I know have found the mediaeval tailors assistant book to be really helpful for shifts, or the tudor tailor book. This means that the steps detailed here are not originating from my brain, but the tudor costume makers and others, though some of the mistakes and how to avoid unfortunately did :blush: . See first the Petticoate – Children’s version, as I am building on that knowledge to do this one. If I had planned this from the start though, I would definately have used red lighterweight wool for the skirt part. 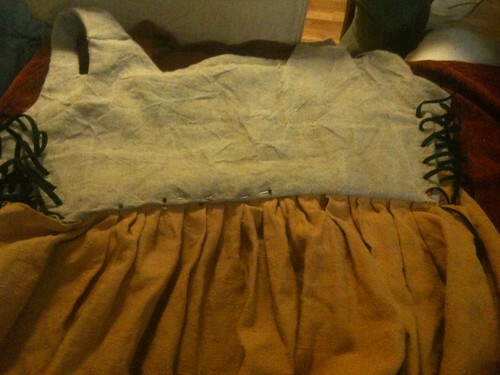 It seems in the future Kentwell may be moving towards the petticoate bodies being a more integral item of clothing for poorer folk, made with a canvas and linen bodice and red wool skirt, so do check on womens layers before you start to make things! Instead of red wool, I unpicked my petticoat – and all those lovely pleats :sob: and cut 2x2m rectangles x my waist to ankle, rehemmed it 2 short sides only. Homestly, you could do this as a single rectangle of 2m. 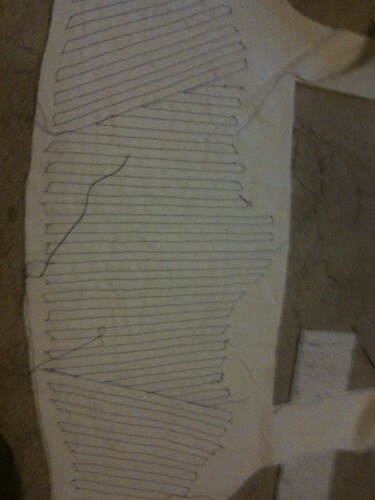 Then my fab helper started me off on the reeded bodice part. looking at all the sewing ahead, i decided this was indeed the moment for a sewing machine. firstly, you need to make a toile. Now this is the pattern of the material in a non fraying cheap material – polyester etc. 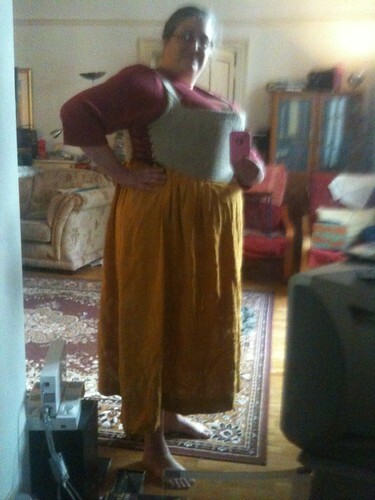 she made this, I have no pics, by putting her bodice on me, cinching it to where it needed to go, then draping all the material over me, cutting out the shape that would suit me and redraping and refining. This turned out to be a front half and a back half. 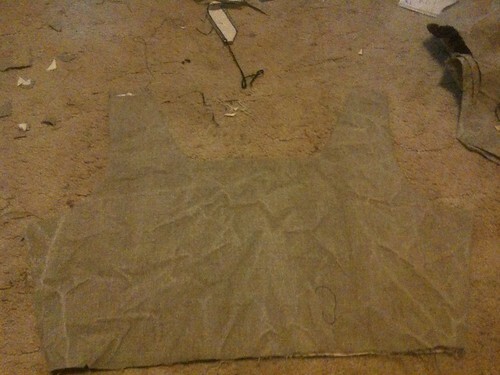 the sides were left so there would be a 2 inch gap between front and back half of material which will be laced together. If you are a novice, you MUST HAVE HELP here. If you are Kentwelling, you either visit an ‘elf’ who will help you make one of these, or you opt for the petticoate above and go to a kentwell costume day or local elf to make a toile for the kirtle bodice and boning. There is an art to toile making. It is relatively straightforward in the bustless, and where you are following the body, but where you are aiming to control the body, it needs someone who knows what they are doing to get the best result. The pictures above show sewing the channels, and also what my front and back look like. The next step is to take your bendal of flat oval reed, and cut to shape so slide a bit down each channel. 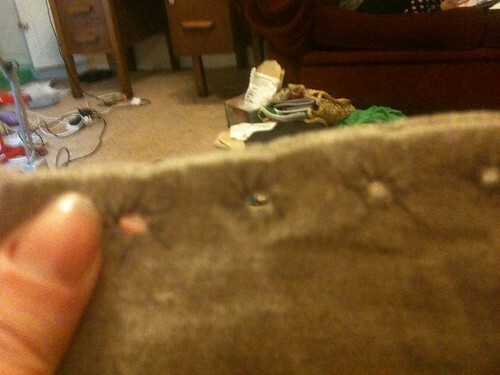 then sew along the top to hold them in place. Iam not sure whether it matters which way the reed faces, or even if flat reed would be as good – probably – but i had the flat side facing in. below is measuring the reed against the channel. 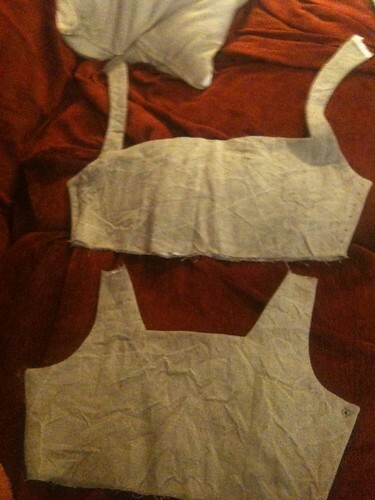 Then try it on, and work out where to sew the shoulder straps together – you can see these are pinned at the back. a line was drawn, the excess bar .5cm cut off, the pieces turned in and sewn shut with whipstitch, and then the 2 pieces sewn tightly together with whipstitch or ladder stitch for each side. Just look how well it supports! It is tight, but actually comfortable – which was a shock to me! so… like before pin pleats! these are going to be knife pleats, with a smooth panel at the front about a handswidth, and then going out to the sides. You are going to leave 5-10cm on each side free and flapping – this is so you can get it on and off over your head. rather odd looking. then pin the pleats to the bodice so that you pin the good front side of the skirt down against the good back side of the bodice so that you haven’t folded under the bodice and the skirt goes upwards over the bodice. argh to not taking a pic that is clear of this. 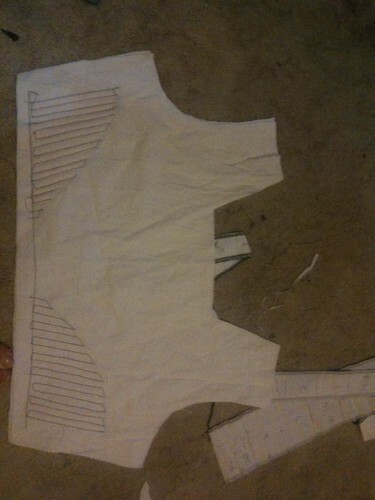 [i mght draw a pic, photograph it and add] but the top edge of the skirt is directly on top of the bottom of the bodice. 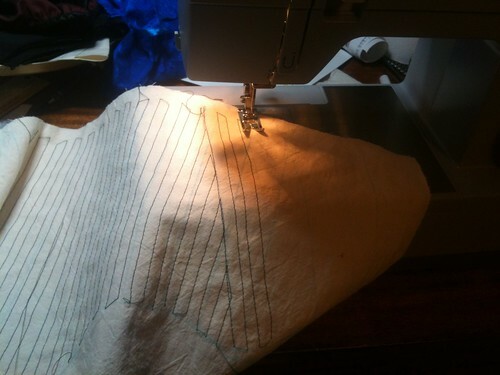 you must make sure that the front linen of the bodice isn’t incorporated. This is so you can easily just sew along the whole thing when pinned with a sewing machine [2ce for luck] and then flip the skirt down so that the skirt and back linen and canvas are all inverted in. you then fold under the front linen and ladder stitch or whipstitch that into place. These are the photos I took – please link to better ones in comments if you have them. You can see the line of stitching and flipped up skirt material in the top picture, and that I am whipstitching the top down [it is visible so hand sewn] over the top. 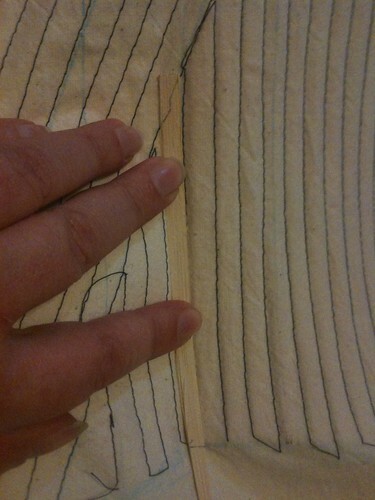 All the seams will be hidden [antifray] all visible stitches hand sewn. Have a look at my kirtle and jerkin pages too if this doesn’t make sense, tho the photos not v clear there either perhaps. the side flapping bits can be left, or you can use hooks and eyes to make look good, or just tuck under. 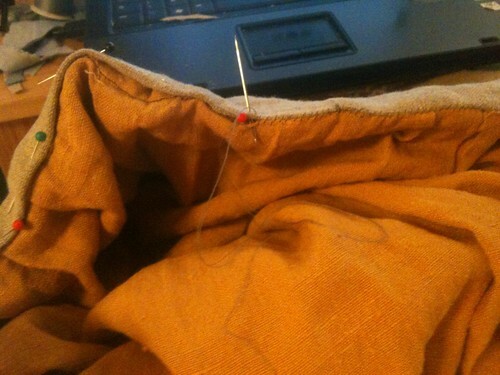 it works like the placket in version 1 effectively. It is very comfortable and v adjustable. Hey! I can see my house from here! Our my back garden… How is it holding up two years on? I am hoping to come along to 2016 (I previously participated 12 years ago – how exactly does one apply these days?) and am having an existential crisis. You may have seen me desperately posting on the fb elves page! I have to make costumes for myself and my 2 daughters (8 and 5 in june) and am really, really struggling. Living in New Zealand, I’m unable to meet any elves, there are no reenactment groups here, and wool is very difficult (and expensive – I paid £27 a metre for my daughter’s Kirtle wool) to come by. What do you use for your interlining exactly? I cannot find ‘stiff canvas’ and have seen in your other posts that upholstery fabric might be suitable? I have made a shift and a bodied petticoat but I am not happy with it, and I think the wool is far too thick. 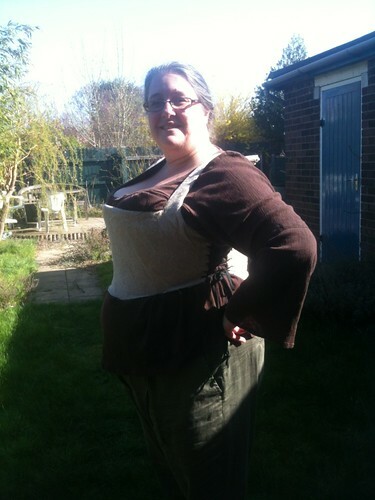 I’ve decided to leave it for now and just carry on to make a woolen Kirtle, the skirt is done, but I am struggling to understand the kentwell bodice making notes. Help!